Audi Q7 Interior, Sat Nav, Dashboard | What Car? 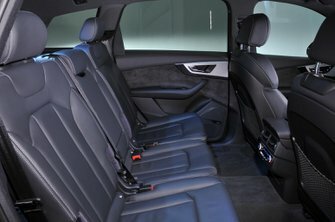 All Q7s come with a fully electrically adjustable driver’s seat. The range of adjustment – which includes an extendable base and four-way lumbar adjustment – makes it easy to find your ideal driving position, although memory seats cost extra. The standard seats on entry-level Sport models are supportive, and pricier versions come with more heavily bolstered sports seats plus an adjustable front armrest. You’ll also find the pedals, seat and steering wheel are neatly aligned for a natural driving posture and there’s a well-positioned footrest to the left of the brake. The dashboard is logically arranged, with user-friendly controls for the air conditioning. Audi's Virtual Cockpit is standard and swaps the usual analogue instrument dials for one giant 12.3in digital panel. This displays speed, revs and other driving essentials as well as full colour sat-nav maps, phone and audio information. 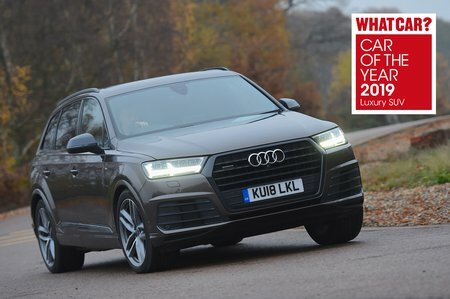 As is a key feature of SUVs, you sit up high in the Q7 for a commanding view of the road ahead, and the slim windscreen pillars do little to obstruct your vision. Large heated door mirrors offer a clear view of what’s approaching from behind and the left-hand mirror tilts down automatically when you select reverse for a better view of the kerb when parking. Powerful LED headlights are standard on S line models and above, and even Sport trim gets you fairly bright xenon units. Meanwhile, a heated front windscreen is available as an option across the range. Thick rear pillars and large rear headrests block much of the over-the-shoulder view, though. The standard front and rear parking sensors help, and all trim levels get a reversing camera. A 360deg camera is standard on the range-topping Vorsprung model and you can even have a night vision camera if you're prepared to pay extra. Audi’s MMI infotainment system is second only to BMW’s iDrive for ease of use, so pairing phones or programming the sat-nav is a doddle. A high-definition 8.3in screen rises from the top of the dashboard and is controlled using buttons and a simple rotary controller on the centre console. The touchpad next to them is also standard and allows you to enter hand-written instructions letter by letter. Entering a postcode into the sat-nav is an example, but it tends to be quicker just to scroll through the keyboard. As you might expect, the Q7 comes with sat-nav, Bluetooth and steering wheel-mounted controls. Under the front centre armrest are two USB ports, and the glovebox houses a SIM card slot for 4G online connectivity, a DVD drive and two SD card slots. There are also 12V sockets for front and middle-row occupants, but it’s a little disappointing that there are no USB points for rear-seat passengers. Vorsprung models come with a standard Bose 3D sound system, but if you really love your music and have deep pockets, then the phenomenal Bang & Olufsen version is worth considering. Likewise, if you make lots of calls on the move, Audi's 'phone box' is worth considering as it improves reception, can charge your phone wirelessly and allows up to two phones to be connected to the car simultaneously. This is standard on Vorsprung trim. A digital TV and a mobile entertainment package (comprising detachable 10.1in touchscreens for the front seatbacks) are also on the options list. The Q7’s dashboard and interior at large is a universe of soft-touch materials and well-damped switches; any harder plastics are confined to less noticeable places. Real metal (or wood, if you prefer) inlays only add to the wonderfully classy ambience. Meanwhile, the rotary controller for the MMI infotainment system has a particularly satisfying action, and the muted thud each time you close a door cements the impression of solidity. The perception of quality is a step above the Volvo XC90 and even the Land Rover Discovery. In short, the Q7 feels incredibly well screwed together, with tight gaps between the exterior body panels and interior trims. If you're still not satisfied, various leather packages are available to lift the bar even higher.